The Defense Advanced Research Projects Agency (DARPA) and the Army Research Laboratory (ARL) are supporting an international research collaboration with a $6.4 million contract to investigate the mechanisms behind “resilience” following malaria infection. The research partnership is part of DARPA’s Technologies for Host Resilience (THoR) program and is termed the Host Acute Models of Malaria to study Experimental Resilience (HAMMER) project. HAMMER is one of a several projects in the THoR program, established for a three-year period, covering a variety of diverse host-pathogen model systems. The HAMMER project uniquely focuses on malaria and its effects on human and non-human primate hosts. Researchers at Emory University, the University of Georgia, and the Georgia Institute of Technology, along with national and international collaborators, will work to identify host features associated with resilience, thinking beyond the host’s immune response into the realms of physiology, biochemistry and pathogenesis, and develop interventions that could enhance that resilience. “Malaria is a potentially lethal disease, but resilience in some people and non-human primates allows them to control the disease and avoid adverse outcomes, so that the infection is not incapacitating,” says Mary R. Galinski, Ph.D., professor of medicine and infectious diseases at Emory University School of Medicine, Emory Vaccine Center and Yerkes National Primate Research Center. In addition to Galinski, key leaders of the THoR HAMMER project include Juan B. Gutierrez, Ph.D., associate professor of mathematics and bioinformatics at the University of Georgia, and Rabindra Tirouvanziam, Ph.D., assistant professor of pediatrics at Emory University School of Medicine. The project includes more than 40 established investigators in infectious diseases, systems biology, physiology, pathology, immunology, genomics, bioinformatics, pediatrics, cardiology, pulmonology, biomedical engineering, and mathematics at the three institutions, and through other collaborations. The researchers’ ultimate goal is to test candidate therapeutic interventions in highly susceptible hosts with the aim of reducing disease severity and death in the absence of effective antimalarial chemotherapy, or in conjunction with antimalarial chemotherapy. If successful, such host-directed therapeutic strategies could be available for use by people in need, whether they are infected with P. knowlesi, other species of Plasmodium, and possibly other pathogens. These challenging goals are fitting with DARPA’s track record taking on some of the world’s most difficult and creative research projects, venturing into unchartered scientific territory. 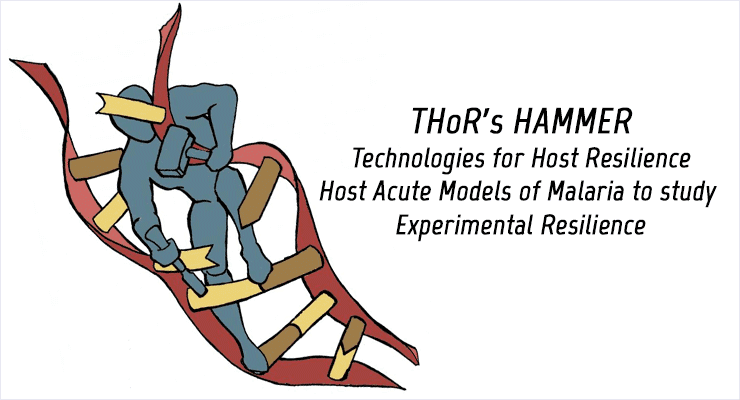 The THoR’s HAMMER project builds upon the scientific infrastructure of the Malaria Host-Pathogen Interaction Center (MaHPIC), a malaria systems biology partnership between Emory, UGA, Georgia Tech, and the CDC Foundation, established in 2012. Through its robust, multi-institutional research partnership and global collaborations, MaHPIC has used technological advances to conduct innovative systems biology research in non-human primates and applied mathematical modeling tools to integrate large, diverse datasets, including from human samples. The MaHPIC and HAMMER team members will work collaboratively to further the distinct goals of both projects.